The star Achernar and the constellation Eridanus. As we are now well into Christmas week, many neighborhoods are marking the holiday season. Streets, homes and stores are decorated in lights and festooned in evergreen, and everywhere, there's the smiling face of jolly old Saint Nick. When I was a young boy growing up in the Bronx, one house in our neighborhood was transformed into a veritable twinkling wonderland in December. Its many decorations included a giant Christmas tree spangled with thousands of multicolored bulbs that almost seemed to rival the famous Rockefeller Center tree in Manhattan. But while most visitors gravitate toward such decorated homes to gawk and take pictures, my own primary interests were with the other neighborhood homes that were either across the street or positioned (unfortunately) on either side of the dazzling light show. I always felt kind of sorry for them, because, while they were adorned with their own pretty holiday decorations, none could hope to match their local version of Times Square. And this is the perfect analogy for our current evening sky, since, at this festive time of year, nature also seems to decorate the sky with bright stars. To see what I mean, just go outside this week and face southeast at around 9 p.m., and you'll be able to see the celestial version of a house decorated with bright lights and ornaments. Orion is the constellation that seemingly has everything, and everyone from astronomy neophytes to assiduous amateur astronomers is always drawn to it. Where else can you find two brilliant stars — ruddy Betelgeuse and blue-white Rigel — that are on diametrically opposite ends of the stellar evolution scale? Let's also not forget the Hunter's always-catchy three-star belt and the famous Great Nebula in his sword, known to be an incubator for new stars. Located due south in the sky at around 10 p.m. is the River Eridanus, a long, curving and meandering stream that shares with the Milky Way the title "River of Heaven." Recently, we turned our attention to an unusually close approach to Earth of the asteroid 3200 Phaethon. Classical legend holds that Phaethon, son of the sun god Helios, fell into the River Eridanus after losing control of his father's chariot, which carried the sun across the sky. Eridanus is one of the sky's long, winding constellations, consisting of a long trail of moderate-to-faint stars. It is nonetheless fun to trace out. Its source lies immediately to the west of Rigel in Orion, with a star called Cursa. Among the river's long stream of stars is Epsilon Eridani, one of our closest stellar neighbors at a mere 10.7 light-years away from Earth. Back in 1960, Epsilon Eridani, was monitored by Project Ozma, the first-ever effort to detect radio signals from a possible alien civilization. 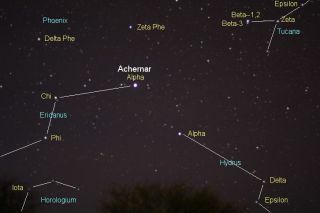 At the mouth of the river is first-magnitude Achernar, the brightest star in Eridanus. Achernar takes its name from the Arabic "Al Āhir al Nahr," the "End of the River." The star is positioned so far south that only those who live near or along the U.S. Gulf Coast can get a glimpse of this object as it pokes a short distance above the horizon. Just to the south of Orion and the west of Canis Major (the Big Dog) is a group of faint stars that seem to be arranged in the shape of a bow tie: Lepus, the Hare. Hares and jackrabbits belong to the genus Lepus. And since Orion particularly liked hunting hares, it seemed appropriate to place one below his feet in the sky. The brightest part of Lepus, composed of third- and fourth-magnitude stars, is arranged in a crude rectangle. Most of the other stars are between this group and Orion. Below Lepus, we find Columbia, a star pattern not among the original 48 constellations usually attributed to the ancients. It was created by Petrus Plancius, a 16th-century Dutch theologian and cartographer. In most of the older star atlases, Columbia appears as a dove holding an olive branch in its beak, apparently representing the dove that Noah sent out from the ark after the deluge had subsided, to see if the bird could find dry land — hence the pattern's original Latin name, "Columba Noachii." Within Columbia's boundaries is the place from which the sun and its family of planets are receding in their swift flight toward the constellation Hercules, the "antapex of the sun's way." In 1718, astronomer Edmond Halley (of comet fame) determined that the stars were not "fixed," but rather moved across the sky in what we call their proper motion. In our winter sky, the sun's path in space is taking us away from Columba at about 12.4 miles (20 kilometers) per second with respect to other nearby stars. This week, after the moon has set, try to find Monoceros, the Unicorn, in the Milky Way between the dog stars Sirius and Procyon. Jakob Bartsch, Johannes Kepler's son-in-law, is credited with identifying this star pattern in 1624, but it has been found on a Persian sphere from at least 100 years earlier. Monoceros is the Latin form of a Greek word meaning "one horned," and it seems that the mythical unicorn may have been invented as a confused description of a rhinoceros. The head of the Unicorn, or perhaps the tip of its horn, is a cloud of glowing gas popularly called "the Christmas Tree Cluster," lying between Procyon and Betelgeuse of Orion, 2,600 light-years from Earth. The brightest star in this nebula, designated S Monocerotis, is a very hot variable star that's about 214,000 times more luminous than our sun. Astronomers now recognize the youth of this sort of star; probably less than 10 million years have passed since it began to shine. Other stars clustering in this nebula may not be more than 1 million or 2 million years old. They likely are less massive than S Monocerotis and still appear to be contracting gravitationally and therefore have not yet made it to a stable star life. Would you believe a hot dog? Finally, there is the antithesis of a complex sky pattern, in Canis Minor, the Little Dog. Its brightest star is Procyon, the eighth-brightest star in the sky. It is a yellow-white star, six times as luminous as the sun. Go outside this week and look low to the eastern horizon at around 8:30 p.m. and you'll readily see it. The name Procyon has been in use since the days of ancient Greece. It is the equivalent of the Latin word "Antecanis" or "Before the Dog." This is an allusion to the fact that Procyon rises immediately preceding Sirius and thus heralds the appearance of the great Dog Star. But there is only one other star in this constellation. Maybe instead of calling it the Little Dog, we should call it the Hot Dog? In fact, many years ago, in a prerecorded sky show at New York's Hayden Planetarium, the lecturer on the tape said, "You are somehow expected to see a little dog here, using Procyon and a neighboring star." A voice in the dark called out, "I see it!" The next line on the tape was, "If you do see a dog here, perhaps you had better see a doctor, too." The lecturer's next few lines were hard to hear over the laughter of the audience.